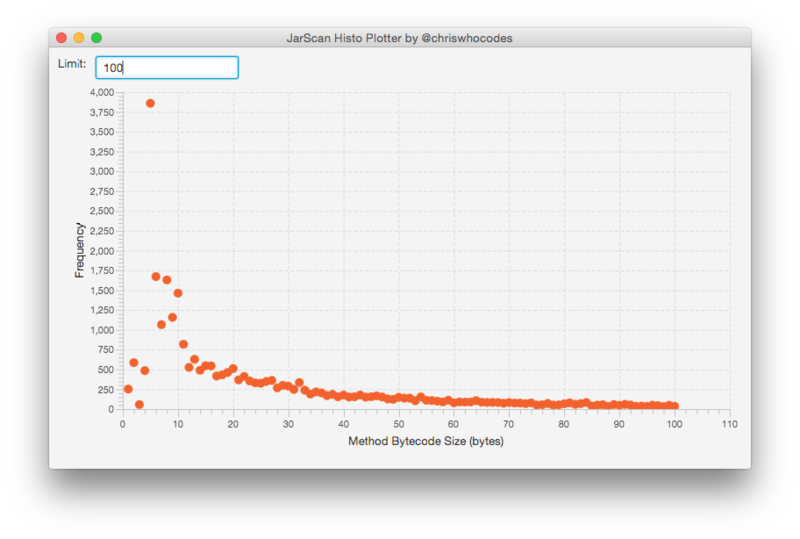 In a not uncommon turn of events I saw a tweet by Aleksey and it sent me off into a JVM daydream and I started wondering what the (bytecode) size distribution of those JDK methods looked like. In my previous blog post https://www.chrisnewland.com/statistical-analysis-of-core-libs-bytecode-using-jarscan-403 I described some enhancements I'd made to the JarScan tool (a program for performing statistical analysis on jar files). This gave me a framework for methodically plodding through jars and crunching stats on the bytecode contained within so it was nice and easy to add a new study to create a frequency count of method bytecode sizes. The new mode is called methodSizeHisto which takes no parameters. Now I'm not entirely happy using rt.jar for bytecode stats because it contains a large number of near identical classes dedicated to i18n as well as whole swathes of packages for Swing, CORBA, and XML parsing which make it a fairly unusual beastie. 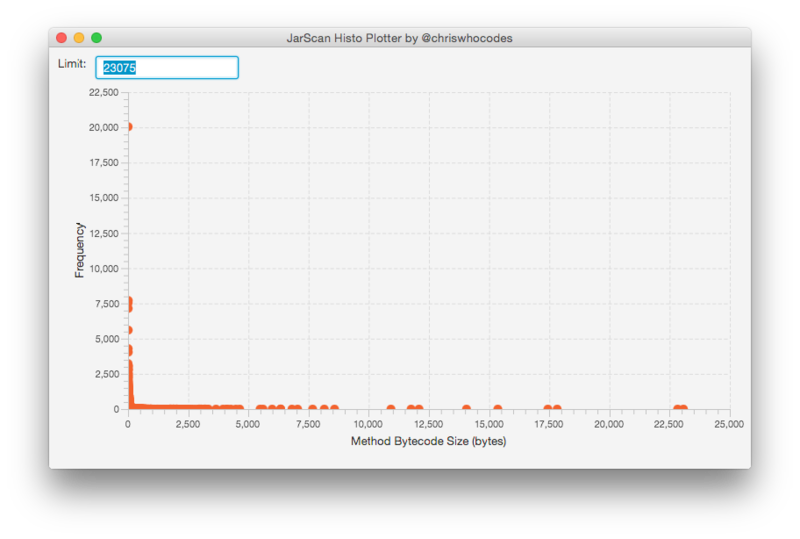 Still a big spike at 5 bytes but at least we don't have those massive (20KB+) methods in the java. * package. So what's the deal with so many methods of 5 bytes in length? 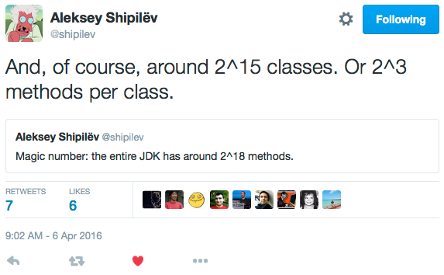 In both the full JDK and in the java. * sub-packages more than 12% of all methods consist of 5 bytes of bytecode. 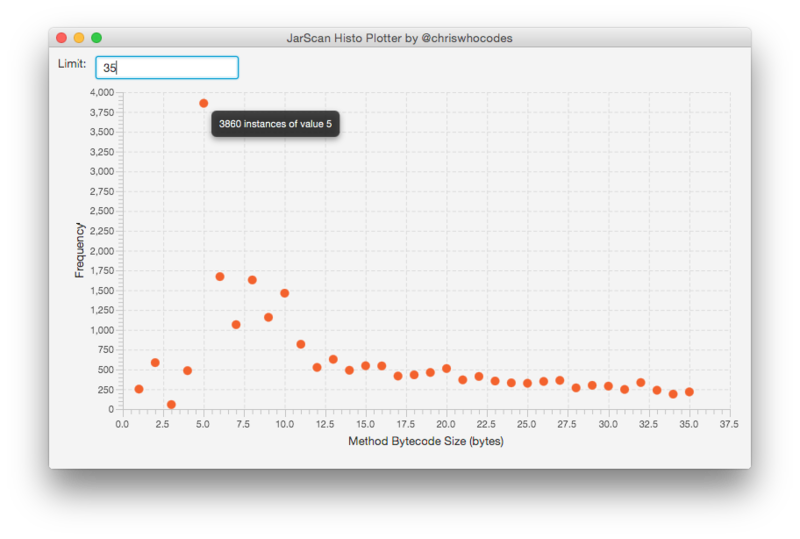 To filter all methods of a given length I created another mode for JarScan. 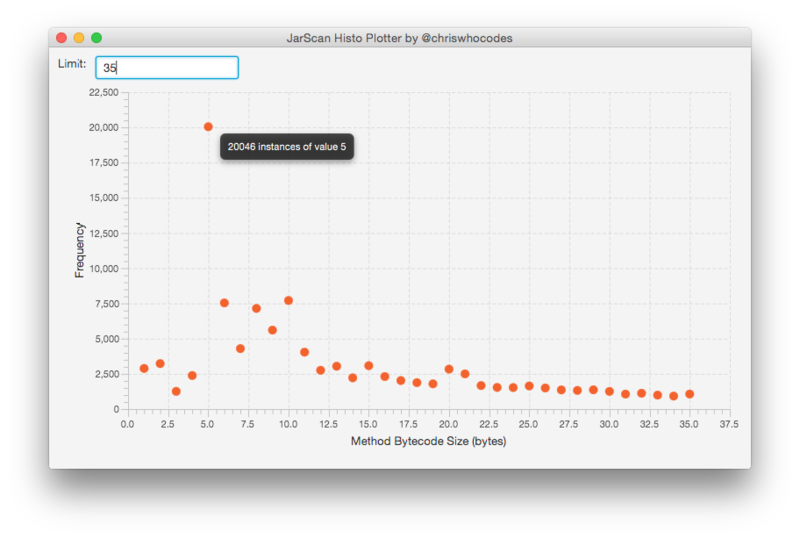 The new mode is called methodLength and requires a --length parameter. What does a getter look like? The aload_0 instruction pushes "this" onto the stack. The getfield instruction fetches a field from an object. The return instruction (in this case areturn which returns an object reference). Each instruction is represented in 1 byte (hence bytecode) and the getfield instruction takes a 2 byte parameter which is an index into the runtime constant pool of the current class. 3 instructions + 2 byte parameter = 5 bytes of bytecode. Feel free to play around with JarScan and let me know if you find anything cool!